These cookies have half the fat of regular chocolate chip cookies! 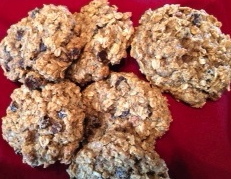 While making a batch of chocolate chip cookies, I asked myself, “Why not try to make them healthier? It can’t hurt!” And so I did. I LOVE cookies, but I hate seeing all that fat go into them. These cookies please the palates of teenagers (who don’t usually admit to liking something ‘healthy’), and you’ll find it easy to miss out on having one yourself if your house is full of kids. It’s a big batch of cookies—I like to make them monster-sized (using a large ice-cream scoop), which yields about 24 cookies, or you can make them smaller. Just adjust the baking time (less time for smaller cookies). Add the following ingredients in order, and beat after each addition. You’ll probably need to use a heavy wooden spoon to mix the last two ingredients in. Drop cookie dough on a baking sheet (I use a non-stick Sil-Pat) with an ice-cream scoop and press flat before baking them for 15-18 minutes at 350˚ or until the edges are brown and the middle looks set. Remove from oven and let cool on the baking sheet for 5-10 minutes before removing to a cooling rack.